I wouldn’t normally review a Starbucks – I will happily admit that I visit Starbucks a lot (they have the best mochas) but they’re all essentially the same and mostly indistinct. However, a Roastery opened up in New York a few weeks before we visited which is very different to the average store so I thought I’d get a blog post out of it! 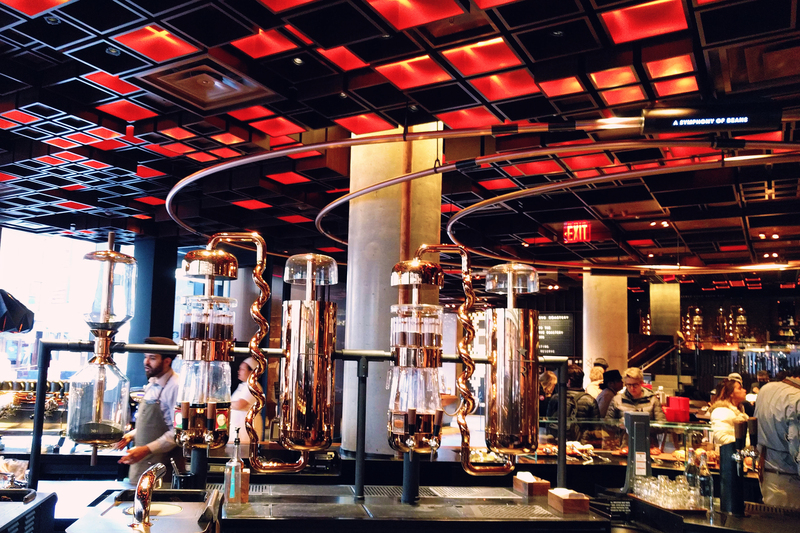 The Roastery in New York is the fourth store to open globally, with two further sites planned. It’s located next to Chelsea Market on 9th Avenue, right opposite our hotel, so I had assumed we’d visit on a couple of occasions. It’s huge, with many websites reporting on the 23,000 square footage, three separate coffee bars, a bakery, a scooping bar, and plenty of merch to buy. All this, plus the roastery of course – where coffee beans are roasted on site in very fancy industrial equipment. Every time we walked by it, the queue snaked around the block, controlled by bouncers on the doors. I don’t know if it was because it had only been opened a couple of weeks but it was crazy. However, one morning we were up early and we noticed that there was no queue, so we popped in to see what the fuss was about. As soon as you get through the heavy wooden doors, I was overwhelmed. 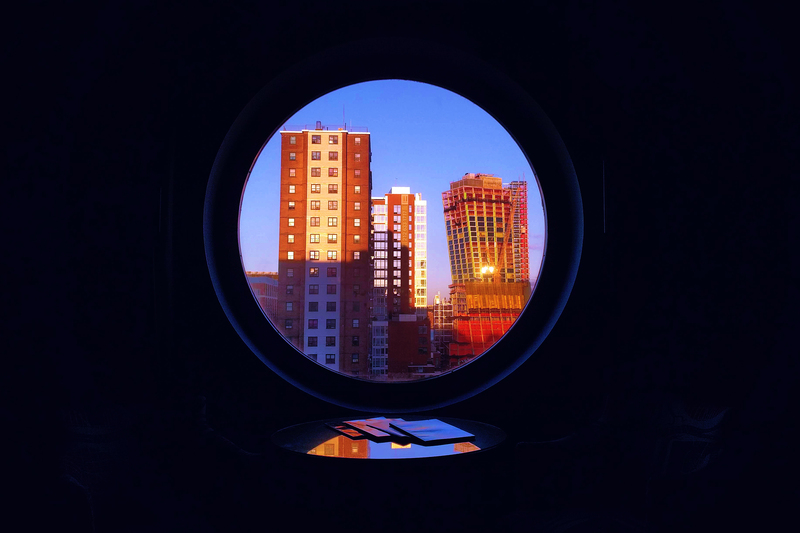 There is so much going on, but I saw the main bar directly in front of us, so aimed for that as a place to start. The main bar seems to involve a lot of confusing equipment, but this is where you get your standard Starbucks drinks. 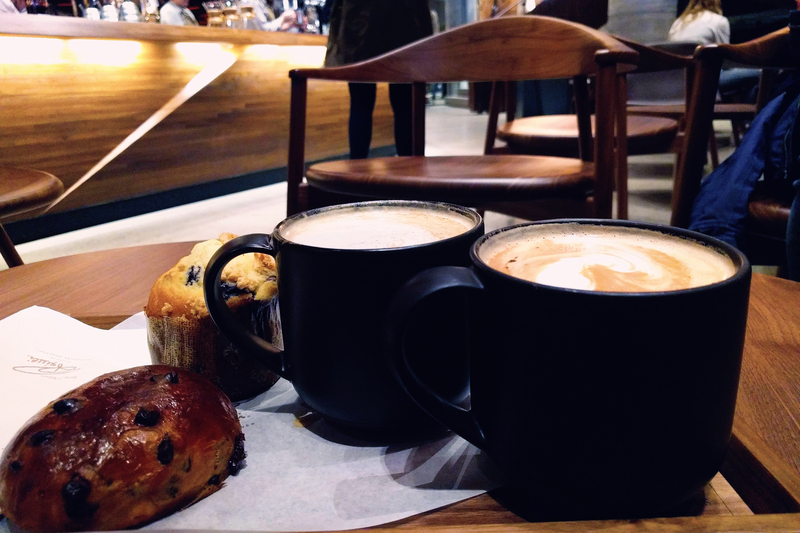 They serve Princi pastries which all looked delicious, so in addition to our normal drinks – a latte and a mocha – we added a chocolate brioche and blueberry muffin to our order. I then had a heart attack when the total came to $28. Holy crap, this had better be good. Things then got very chaotic as we waited for the drinks, and it took about 15 minutes for them to come out. There are an insane amount of staff milling about (with ridiculous, almost patronising uniforms – think Peaky Blinders meets Get Out) and whilst many people would enjoy the buzz that this creates, it was too much for me. In the time we waited, the place had started to fill up, and we realised that despite the size of the building, there really wasn’t very much seating around. I sent Husband off to see if there was additional seating down at the “Experience Bar” (fortunately there was, and it was quieter). 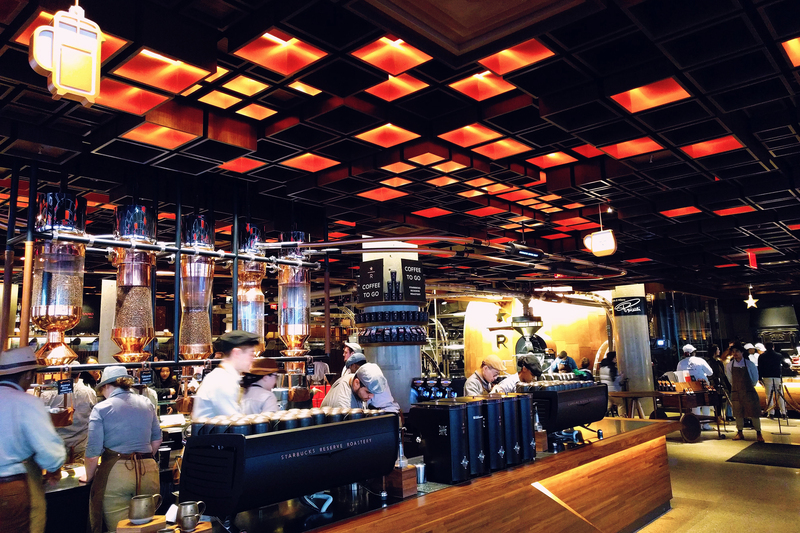 The Experience Bar is where to go if you want something unusual – glass bottles full of coffee heated by complicated lamps, flights of espresso with different flavours. Above this is the third bar called Arriviamo serving cocktails – this was closed when we visited (understandably as we were there early) but looked pretty interesting, if not expensive. And of course, there’s a lot of merchandise, although I think they need to pare it back a bit. As mentioned, I visit Starbucks a lot so have a few re-useable cups which are light enough to carry in my purse but I couldn’t find anything like that here – there was a lot of high end products, elaborate coffee kit, even things unrelated to Starbucks, and I found it quite frustrating. So was our breakfast worth $28? Hell no. I found the whole thing quite stressful, too busy, and entirely unnecessary. The Princi pastries were nice and I’d love the regular stores to start selling them, and Husband noted that his latte was delicious, but my mocha was tasteless and really not worth whatever they charge for it. As we sat with our drinks, a member of staff came around offering sparkling water which got topped up, so that was a nice touch. The furniture was beautifully made, and I lusted after the wooden chairs, and it definitely felt like we were in a more luxurious store, but is all this a good reason to visit? I don’t understand why people would queue for this store, especially not in the depths of a New York Winter – I just don’t get why you need a bigger and way more expensive version of a Starbucks. I can’t see that the staff from the Google offices opposite would visit this every day (or maybe they would, maybe I’m wrong) so I guess they’re relying on tourists like me visiting for the novelty value. If you are in desperate need for a Starbucks (and there’s no queue) go in and have a look, but be prepared to spend some $$$. If there is a queue, turn around, cross the road, and get your latte from the regular store opposite. Then sit in the window and shake your head with incredulity at the people willing to queue up for the Roastery, as you sip smugly on your significantly cheaper drink.